£5.99 as of 25-04-2019 12:09:08pm GMT (product prices and availability are accurate as of the date/time indicated and are subject to change. Any price and availability information displayed on the supplier's website at the time of purchase will apply to the purchase of this product). This lovely looking pansy is really realistic and made using exceptionally good quality materials for a realistic finish. It can be used in hanging baskets, pots, planters, outdoor bedding and indoor flower arrangements. It is UV resistant and approximately 30cm in height. At just £5.99, it offers fantastic value for money. Realistic Artificial Purple Pansy Plug Plant (30cm)	Overall rating:	0	out of 5 based on 0	reviews. 38cm artificial purple rose topiary ball £29.99 £24.99 as of 25-04-2019 12:09:08pm GMT (product prices and availability are accurate as of the date/time indicated and are subject to change. Any price and availability information displayed on the supplier's website at the time of purchase will apply to the purchase of this product). 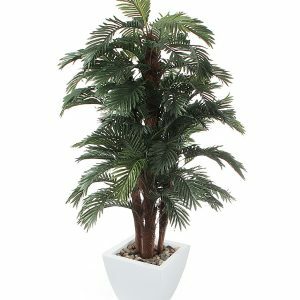 40cm artificial topiary ball £24.16 £23.65 as of 25-04-2019 12:09:08pm GMT (product prices and availability are accurate as of the date/time indicated and are subject to change. Any price and availability information displayed on the supplier's website at the time of purchase will apply to the purchase of this product). Silk rose buttonhole for wedding £3.25 as of 25-04-2019 12:09:08pm GMT (product prices and availability are accurate as of the date/time indicated and are subject to change. Any price and availability information displayed on the supplier's website at the time of purchase will apply to the purchase of this product). Pair of cone shaped artificial flower hanging baskets - purple & yellow £45.95 as of 25-04-2019 12:09:08pm GMT (product prices and availability are accurate as of the date/time indicated and are subject to change. Any price and availability information displayed on the supplier's website at the time of purchase will apply to the purchase of this product). 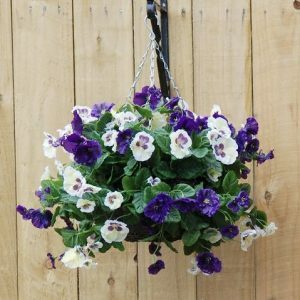 Charming blue and white artificial pansy hanging basket £42.50 as of 25-04-2019 12:09:08pm GMT (product prices and availability are accurate as of the date/time indicated and are subject to change. Any price and availability information displayed on the supplier's website at the time of purchase will apply to the purchase of this product). Artificial Leaf Hedge 1m x 2m £24.99 as of 25-04-2019 12:09:08pm GMT (product prices and availability are accurate as of the date/time indicated and are subject to change. Any price and availability information displayed on the supplier's website at the time of purchase will apply to the purchase of this product).